Home / 2017 / March / 16 / Coaching societal change… Can we coach a nation to be better? There’s a lot of talk right now about the economics of Brexit and Scottish Independence. For those getting bogged down in “things will be worse for a while” let me throw in a much longer-term idea. Coaching societal change. It is also quite significant in its impact. If we were coaching Scotland to be more successful what would we be focusing on? Improving self-confidence and dealing with challenges? Being better at negotiation? (Compared to what’s currently coming out of Whitehall – that isn’t too hard to achieve or believe possible.) Developing Emotional Intelligence would be good. We might also encourage more sales training to maximise the value of the existing outputs or to develop new markets. So why should an economy be any different to an individual at the macro level? If we want to help an individual step up and be more assertive and in control of their destiny – that’s precisely what we can do. I don’t think that a small nation is much different. Just spend the time (as coach) in finding out what the issues are. Then help the client to determine a sensible way forward. Sounds like a political dialogue to me. Engagement with the electorate. Not a head-to-head bully match with the establishment from south of the border. Westminster’s paranoia is all about self-interest of the ruling elites. Hectoring the First Minister that it is not the time for a further referendum is ridiculous. This is definitely NOT coaching societal change. To quote Theresa May on 16 March “they [the Scots] would be being asked to make a crucial decision without the necessary information”. This was a fact that didn’t seem to bother the UK Government at the time of the Brexit Vote. Even now, there is no clarity about what the UK actually voted for. What is clear is that in Scotland the electorate voted overwhelmingly for a European status quo. (Almost the two-thirds that Richard Dawkins suggested should have been the benchmark anyway). It’s well-known that health is strongly linked to being in control of one’s environment. Stress is lower and that means less cortisol which breeds all sorts of nasty degenerative and chronic disorders. So having less stress in society is a good thing. That leads to two separate conclusions. As individuals a large proportion of the Scottish population are currently stressed beyond acceptable levels. The West Central Belt has health outcomes that drag the whole of Scotland to the bottom of the European pile. Regaining self-respect and (more) local control will reverse that. The dividend for NHS Scotland would be massive and far outweigh the costs of rebalancing an economy in the medium term. Scotland is already focusing health on prevention rather than cure – it’s sound economics but will take a couple of generations to work through. A great case for coaching societal change. We might consider Scotland as a *person*. It too would feel better about itself and behave in a less-stressed manner. Countries that are a little more care-free are a joy to live in and to visit. Who would NOT want their nation to fulfil those criteria? The indyref NO arguments take neither of the above into consideration. So then to try and assume that the entire case is an economic one is – to coin a phrase – utter balderdash. For once it is not “all about the economy – stupid!” Coaching societal change will alter things. 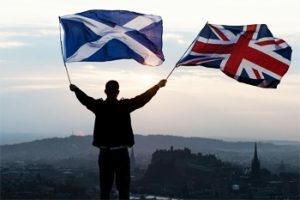 Which flag will reign over Scotland if we succeed in coaching societal change? Oil revenues will wax and wane but renewables will continue to rise. Scotland already has the biggest biomass generation plant in the UK at Lockerbie. This is feeding power to 63,000 homes. Add in wind, hydro and tidal and the exportable values continue to rise. In addition there are a slack handful of world-class research institutions that would still be part of a European research network. This would be highly attractive and continue to earn for the education sector. Foreign companies base themselves in Scotland for a variety of reasons. Why would Japanese or US hi-tech companies favour Livingston over Bristol or Manchester? But they do – in some numbers. So that is not going to change significantly. And Edinburgh has seen a steady influx of foreign financial services institutions that would likely continue. I would argue that Scotland provides a disproportionately high amount of UK defence. Whether that’s boots on the ground, facilities or other aspects. An independent country would share defence (via NATO). It could charge for sovereign bases if leasing them to the RAF. Shedding the cluster of jobs connected to Faslane would be expensive. However a little creativity would soon replace the impetus to the local economy. Helensburgh is hardly a boom-town anyway so modest regeneration efforts are feasible. A bit more coaching societal change required. Let’s not forget that a lot of people based at Faslane are sending money to support family elsewhere in the UK – it doesn’t all get spent in the hotels or shops at Arrochar. Let’s think about shipbuilding on the Clyde for a moment. 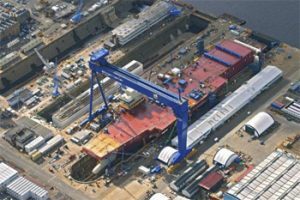 If we can build large aircraft carriers in sections and then assemble them at Rosyth, that is a manufacturing capability that goes beyond defence systems. The physical infrastructure isn’t going to evaporate once HMS Prince of Wales floats out of the dock. There’s also great capacity for building or decommissioning offshore hardware at Nigg and elsewhere. There is huge recycling to be done from the North Sea. So this debate is about well-being and begs a question. What is the political equivalent of cortisol? This hormone that causes so much damage? Well personally I think it is the alt-right thinking that emerges from the pressures. That works through into damaging behaviours that break down societal norms. Take away the reasons for the alt-right and slowly things will revert to a state of modest well-being. Most of the concerns voiced by the common man during the EU referendum were based on negative thinking. Let’s move that to useful thinking to begin with. Coaches can help people to deal with bullying as well as negative thinking. And that makes the case for coaching in the current context very strong. The case for assuming that the existing *management* at Westminster know what they are doing is weak. What would you do as leader? Engage and help people find their feet or hector from the C-Suite (aka No.10)? What is clear is that some people also could do with coaching in leadership. I leave you to suggest who they are.